Rapid correction of hyponatremia is associated with the development of osmotic demyelination syndrome. However, left untreated, severe hyponatremia can cause brain edema, seizures, and death. This apparent dilemma led to concerns in the 1980s that physicians managing hyponatremia were “damned if they do and damned if they don’t”. 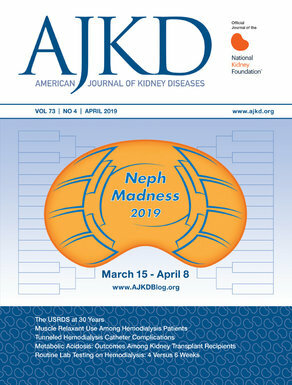 In a recent article published in the American Journal of Kidney Diseases, Sood et al go a step further and describe a preventive therapeutic strategy using hypertonic saline and desmopressin for the safe correction of severe hyponatremia (serum Na+ <120 mEq/L). Dr. Richard Sterns (RS), corresponding author from Rochester General Hospital and the University of Rochester, discusses this study with Dr. Helbert Rondon (eAJKD), eAJKD Contributor. eAJKD: Can you briefly describe your study? Why is it important? RS: The treatment of hyponatremia has been a real challenge. Most people agree that there is a risk of iatrogenic injury if hyponatremia is corrected too rapidly, but in practice, it’s often difficult to maintain correction within the therapeutic limits. We reviewed all the cases we had treated with hypertonic saline and we found that too often correction inadvertently exceeded the goals that we had set for ourselves. The reason for this is that a water diuresis often emerges during the course of therapy. While not always unanticipated, it occurs at unpredictable times. Therefore, we decided to begin treatment with desmopressin to prevent a water diuresis at the very outset and then combine this with hypertonic saline. We found this strategy quite successful, and the majority of the nephrologists at our institution have begun to use this regimen as a routine. This manuscript reviews our experience in the first 25 patients who had been treated in this manner. eAJKD: How did the new goal of 6 mEq/L of Na correction in 24h instead of the traditional 10 mEq in first 24h or 18 mEq in first 48h come into place? RS: The increase in serum sodium of10 mEq/L in first 24h or 18 mEq/L in the first 48h are not goals; instead, they are thresholds over which patients begin to develop complications. There aren’t too many therapies where you set your goal at the toxic range. We don’t treat with digoxin to achieve a level that is at the toxic range. I don’t think it is ever wise to seek a correction of 10 mEq/L in the first 24h or 18 mEq/L in the first 48h because people just barely exceeding those limits sometimes develop complications. There is no evidence that correction by more than 6 mEq/L per day offers any advantage, and the best evidence available suggested that 6 mEq/L is enough correction to treat the most serious complications of acute hyponatremia. eAJKD: Would severely symptomatic patients benefit from this therapeutic strategy? What patients would not be candidates for this therapy? Yes, the protocol is adaptable to patients with severe symptoms. We would recommend that patients with severe neurologic symptoms be treated with a bolus of hypertonic saline, as were a few of the patients in our series. There is nothing about the regimen that precludes this. By co-administering DDAVP, you are assuring that once the acute emergency has been dealt with (with a bolus or brief rapid infusion of hypertonic saline), inadvertent overcorrection of hyponatremia does not subsequently occur. I would not advise treating patients with self-induced water intoxication due to psychosis with this regimen. In the psychotic patient treated with DDAVP, one cannot be assured of the control of water intake. Other patients where this regimen is not advised are patients whose hyponatremia can be confidently attributed to severe heart failure with edema, or cirrhosis and ascites. Those patients are not at risk of developing a spontaneous water dieresis and there is no point in giving them DDAVP. Also, one would usually not want to treat those patients with hypertonic saline either. Finally, there are patients who clearly have chronic SIADH with no other confounders. For example, in a patient with small cell lung cancer in whom the diagnosis of SIADH is well established, there’s little to be gained with this regimen. eAJKD: Many patients in your study have transient or persistent SIADH. How do you justify giving DDAVP to patients with already high levels of plasma ADH? RS: What we have found is that in patients with severe hyponatremia, there is seldom one single cause of hyponatremia. They often have multiple causes of the hyponatremia. We realized no harm in treating a patient with increased endogenous vasopressin with more vasopressin. If the urine is concentrated because of endogenous vasopressin, it’s not going to get any more concentrated by giving extra synthetic vasopressin. This permits a protocolized treatment of severe hyponatremia. It allows you to evaluate the patient, and in the meantime make sure the hyponatremia is safely corrected. eAJKD: What is the role of fluid restriction in the therapeutic strategy you are proposing? RS: Fluid restriction need only be modest because you’re giving hypertonic saline. If fluid is not restricted, it would increase the requirements for hypertonic saline and make things more complicated. Our objective is to create an iatrogenic state of SIADH, and then treat that iatrogenic SIADH (it is SIADH caused by the administration of desmopressin). We treat that like you would treat any other patient with SIADH: fluid restriction and hypertonic saline to achieve your therapeutic goals.